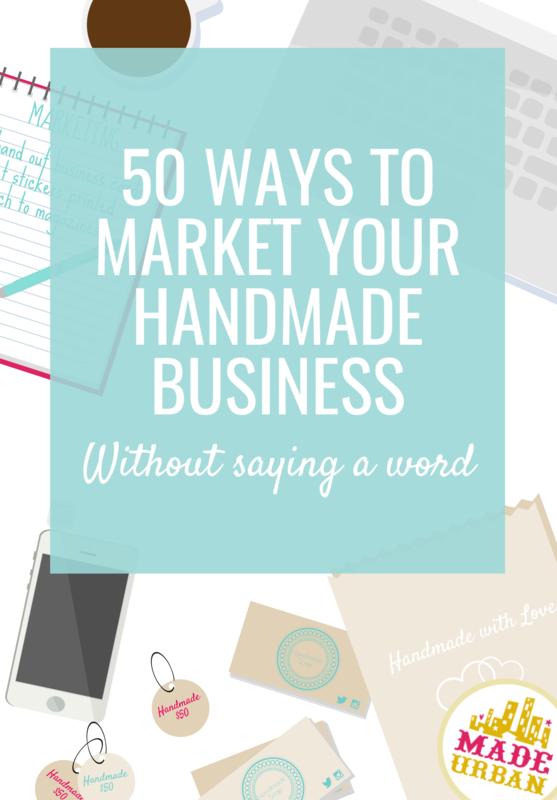 Many handmade business owners don’t like to market. They don’t spend enough time marketing, aren’t sure what else to do besides post to Facebook, post to Instagram, pay for an ad, etc. And maybe aren’t even sure what exactly marketing is. I feel ya! Marketing, advertising, branding, social media strategies…there’s a lot to learn and cover as a small handmade business owner. But without marketing, people won’t hear or learn about your business and products, which obviously affects your sales. Let me help spark, some ideas to help you market your handmade business and do your best to let your products do all the talking. I’ve launched a new ebook! Yaaaaay. My first ebook MAKE MORE MONEY AT CRAFT FAIRS has exceeded my expectations with all the feedback I’ve received. I never imagined I’d have so many people voluntarily reaching out to me, just to tell me how helpful they’ve found the information in MAKE MORE MONEY AT CRAFT FAIRS. That response is what inspired me to write my second ebook THE SUCCESSFUL INTROVERT. The idea for it actually started with a list I was compiling for an article. It was going to be 10 WAYS TO MARKET YOUR BUSINESS WITHOUT SAYING A WORD. 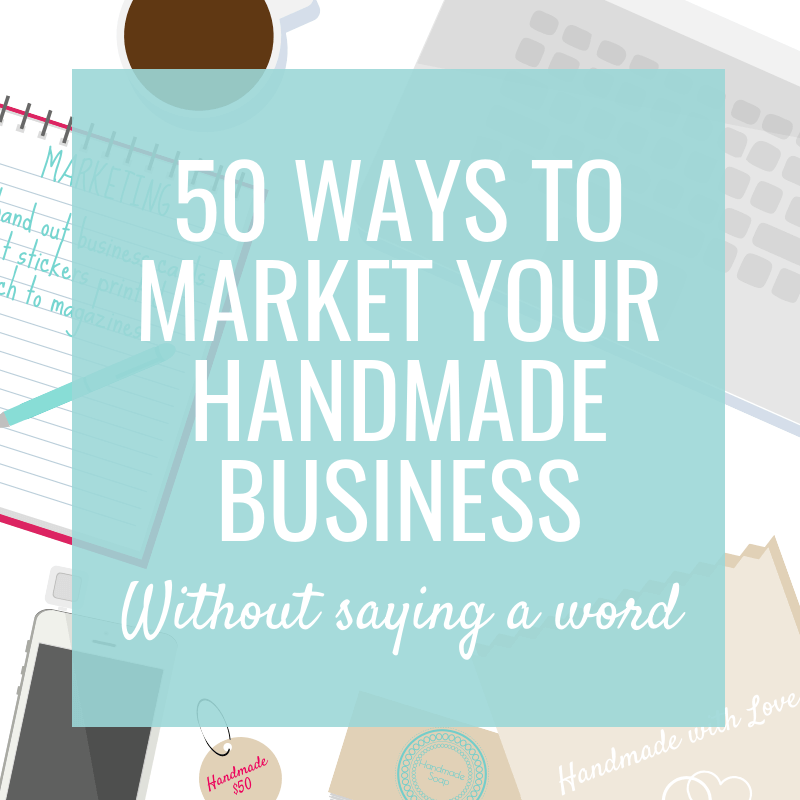 But my list kept growing and growing and soon I had over 50 ideas to market a handmade business! 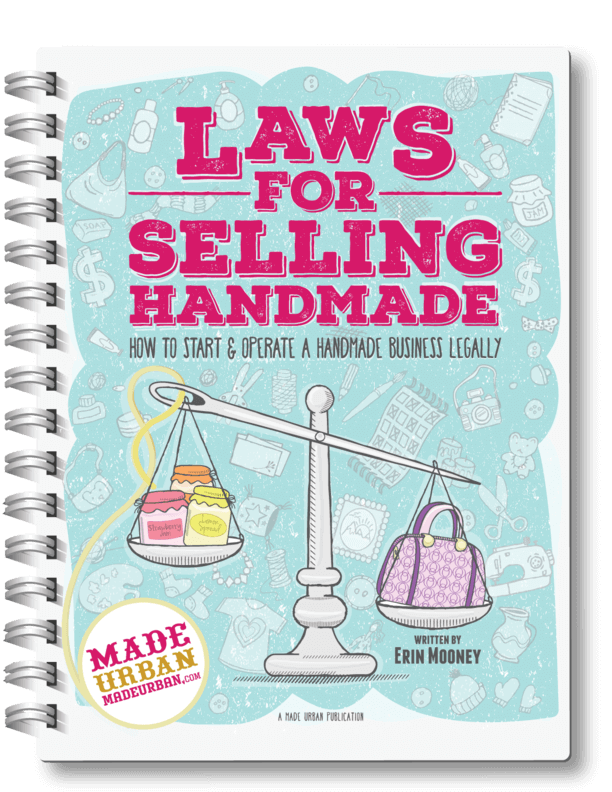 From there the idea continued to grow into 6 chapters covering how to run a successful handmade business requiring as few words spoken as possible. I’m going to share 5 of my favorite marketing ideas for when you don’t feel like talking, in this article. You can sign up for our newsletter to receive 20 more of those tips and if you want the whole shebang (50+ marketing ideas), you can download my ebook for $9.99. THE SUCCESSFUL INTROVERT also has 50 more tips in Chapter 6. But they’re tips for calming nerves before, during and after a speaking engagement or media interview. If you’re not a fan of getting in front of people and talking about your product, you’ll love that chapter too. Some techniques can be considered a form of vandalism even if they’re not permanent (such as yarn bombing or sidewalk chalking…if you can believe it). Always check local laws when you’re dealing with public spaces or with the owners of private properties before taking any action to market your business. Put together a list of handmade items that combine your products with other small business’. Contact handmade vendors with an offer to include their products in your gift guide if they agree to share it with their audience. If you get several people sharing the guide it can reach a large number of people. Those who participate get their business name and URL in the post and a linkback to their website as an additional perk (which can help boost their website’s SEO). Curate a group of products to help shoppers cross each person off their gift list. And be sure each participant provides high-quality photos that will look great in a collage. Google “online awards for ____________ (your product category)” to see if there are any competitions you can enter. Make sure you’re comfortable with the obligations you’ll have if you win. If nominees are required to travel to ceremonies and winners must give a speech, you might want to steer clear. Being an entrant alone can give you some decent exposure when people check out the candidates. And if you win that’s some serious street cred to brag about…not to mention perks the winners receive. We all know to hand business cards to people when the topic of our products or services comes up. But there are other more “oops, did I drop a card there?” kind of ways. Keep a stack of business cards in your wallet and anytime you’re someplace your ideal customer may be, casually leave a card behind. It’s for no one in particular but the right person might pick it up. Make sure your card has a professional design that catches attention. A basic white card with your business name, address and website will probably get pushed aside or tossed out. Do something out of the ordinary to encourage people to pick it up for a closer look. Be sure the card mentions the benefits of your product (it’s not what you sell, it’s why you sell it). 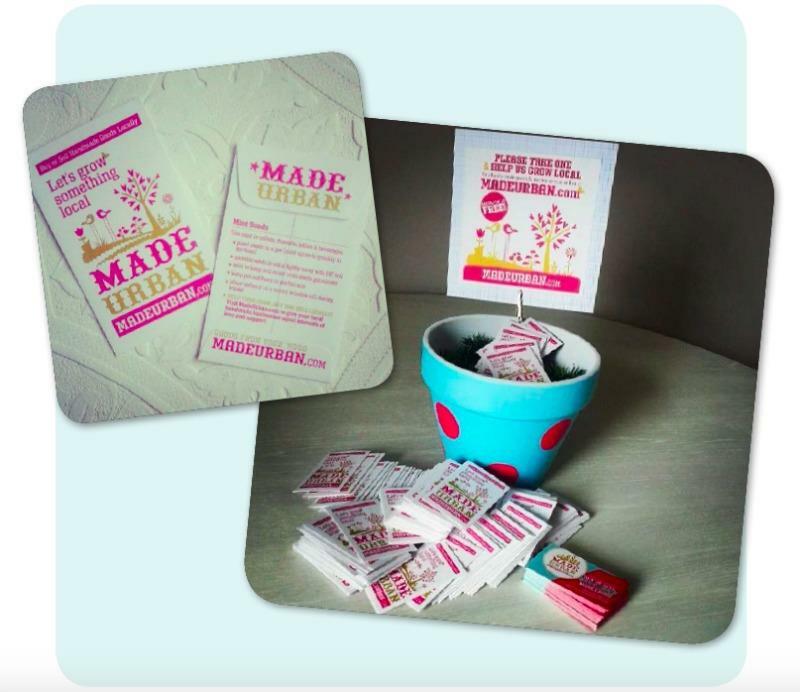 When we first launched Made Urban and were marketing it locally, we made business cards out of small envelopes. We included the phrase “GROW SOMETHING LOCAL” and placed mint seeds inside. They cost pennies to put together but garnered a lot more attention than a plain business card. Magazines– head to a bookstore and slip your card into the spine the way subscription forms often are. Choose magazines aimed at your demographic. Restaurants– leave one with your tip or on the counter of the bathroom. Coffee shops– slip one into the magazines they have for patrons, leave one on a table or by the cream and sugar. Public transportation– leave a card behind on the seat or on the window ledge of a bus, cab, train, etc. Local shops– email boutiques that share your target audience and ask if they’d be interested in keeping a stack of your business cards on their counter. You have to consider what the other business is gaining so offer to include their business card in each of your orders. Or you can advertise their business on your website and social media pages. Bathroom stalls– you know those frames on the back of stall doors? Wedge a card in the corner of the frame. People will stare right at it when they sit down. Change rooms– not in the shops you want to get your products into; the owner won’t take kindly to you trying to poach their customers. But think of a busy retailer in the mall that has hundreds of people going in and out of the change rooms on a Saturday. Wedge a card in the corner of the mirror or behind a hook. In Canada, a lot of people “pay it forward” by purchasing coffee for the customer behind them in the drive-through at Tim Hortons 😉 This is a really nice gesture but doesn’t market your business, unless you ask the cashier to pass your business card on to them. A more effective idea may be placing a lower priced item from your product line in a high traffic area of your city with a note attached. If you’re in need of a little joy today, take me with you. When you see someone else who could use some kindness, pass me on. Be sure the item is branded with a label/tag and your business card. Include your website so people can contact you to purchase one of their own. Add your social media pages and ask people to snap a picture of themselves with your item, post it and tag you. Be prepared, it may not get passed on or shared to social media. Visit my website to purchase your own Pay it Forward Plushie and make the world a happier place. You need to stay ahead of the game when working with magazines. They plan issues months in advance so if you want your products to appear in a Christmas gift guide, start planning to pitch in the summer. Editors are always looking for cool products to feature so search for magazines that reach your target audience and publish gift guides. Appearing in a gift guide typically only requires a couple emails back and forth (no phone interviews) so this is a great option to gain some big exposure without having to talk. When sending products by mail, brand the box, bag or wrapping. Millions of boring- looking boxes are shipped every day, it wouldn’t be hard to make a package stand out. A bright colored box or big bold sticker could do the trick. You never know who might see that package, be curious about what’s inside and check out the website you have printed on the outside. Your article is greatly appreciated. I have vigorously tried to market and advertise my business helping women in need to no avail, with limited funds and resources. This information is a true blessing. Thank you. Really cool post here. Loved the fact that your thinking outside the box. I think my favorite part is that anyone could use the business card method to give a local business a pretty good boost. May use it in the near future. Thanks for sharing and take care.